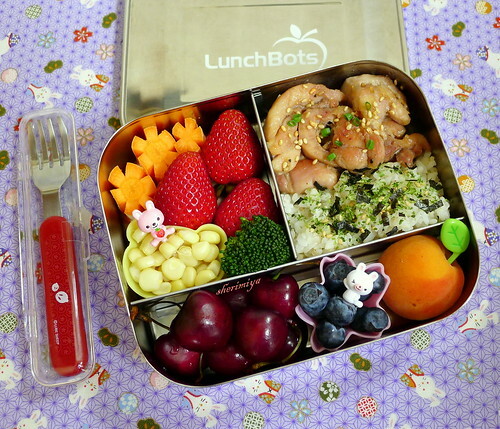 Chicken and Rice Lunchbots Trio Bento, a photo by sherimiya ♥ on Flickr. I this looks really tasty! I love how colourful it is! Cute bunnies everywhere. A lovely bento in a great box. I am still on the look out for the trio box as well, it seems such a convenient, easy to fill box. I never thought about it.... but I suppose I could try. Thanks so much for your interest Liqin :] !! There's no apple in this bento... but you can spray cut apple slices with lemon water to prevent browning.